In an effort to make D.C. a mellow scene on Inauguration Day, Adam Eidinger and his community organization DCMJ will be handing out free joints to the first 4,200 people who line up on the west side of Dupont Circle at 8 a.m. on January 20. These stoned patriots will then descend upon the National Mall to light up exactly 4 minutes and 20 seconds into President Donald Trump’s inauguration speech. Yesterday, we spoke to Eidinger, who wrote Initiative 17, which in 2014 legalized the possession, growth or free distribution of up to two ounces of marijuana in D.C.., about why he’s decided to greet a Trump presidency by hotboxing the nation’s capitol. First, the obvious question: Why are you giving away thousands of joints on inauguration day? This is forced tolerance. If the government isn’t going to be officially tolerant, activists have to come out and do things like give away legal marijuana. The most important thing for us is to distribute the cannabis. It’s not just me; I’m only giving away two ounces. Another hundred or so people will be doing the same. Everyone has the right to carry and give away two ounces, one or two joints at a time. We especially want to hook up Republicans who like to use cannabis — and there’s a lot of them. Even though 96 percent of D.C. voted for someone other than Trump, we’re going to welcome him and his supporters. We’re concerned that a Trump administration is going to overturn local cannabis laws. Now that we’ve had legal marijuana in D.C. for a couple years, we all have marijuana surpluses we’ve grown legally at home. In other words, all the cannabis we’re giving away on Inauguration Day has been grown inside the nation’s capital. We’ve grown it ourselves because it’s tremendously empowering to do so and visitors to D.C. don’t have the ability buy marijuana in stores unless they are medical marijuana patients, which we think is ridiculous. Congress is blocking us from doing that, and this new Congress under Trump and [his nominee for attorney general] Jeff Sessions is likely going to be worse. So we figured we had nothing to lose by starting the fight now. It’s still illegal to smoke in public though, right? We’re intentionally not organizing a mass smoke-in in one spot, because they will shut that down before it starts. We’re telling people that it’s legal to go back to your Airbnb or to someone’s house and smoke it. If you’re smoking in public, you’re committing an act of civil disobedience. The Republicans have been totally out of step on this issue. Trump himself has been all over the place. What’s his position? We’re trying to force him to let us know. As recently as April, Sessions said marijuana was “dangerous” and that he would “enforce federal law all over the country.” If Trump doesn’t like the fact that thousands of people will have joints ready to go at 4 minutes and 20 seconds into his administration, we’ll call the whole thing off if he agrees he won’t overturn local laws. Where will you watch the inauguration? I hope to give away every last joint before I step foot on the National Mall. We’ll be pulling a large sound system in a wagon and handing out hot drinks and food. This is my seventh inauguration living in the city — it’s like Mardi Gras for D.C. It’s important to keep that festive atmosphere. There are Americans coming from all over, some of whom have never been to the capital before. If you get too hateful or angry, the whole dissent is going to be lost on them. Whereas if you can make friends and get people to try marijuana for the first time, you might be able to connect. Why is this such a big deal in D.C.? Since we’re in the nation’s capital, we have a unique role: We can actually make a difference here by going out and doing something. There are 50,000 marijuana users in D.C. We’ve officially become the highest concentration of marijuana users on the planet. Half the population of Adams Morgan uses marijuana regularly. We have a core group of 50 to 100 activists who grow at home, and they’ll be the ones giving away the cannabis. I don’t think we’ll have any problem giving away 4,200 joints in two hours. People from out-of-town need a place to score, so this is perfect for them. They don’t even have to pay anything. Nor are we violating any laws. That’s the beautiful thing: Our generosity is legal. You’ve had smoke-ins at the White House in the past. 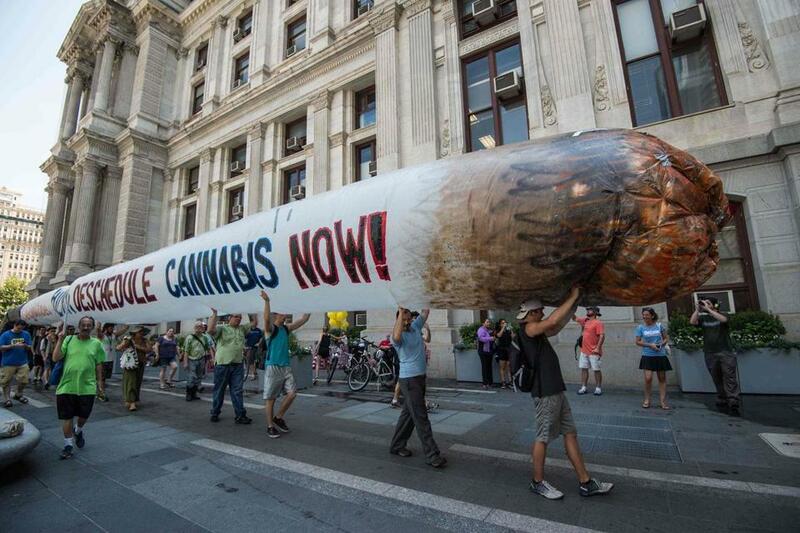 There was even a 51-foot inflatable joint at one of them. How will this be different? It’s a new, creative way of dissent: We’re just giving away the plant, which is perfectly legal under D.C. law. And if you’re a Trump supporter, you’re totally welcome to get in line. There are lots of protests trying to disrupt the inauguration. But not us. We’re just trying to give it a good vibe.